By continuing to use our website, you agree to the following terms and conditions. 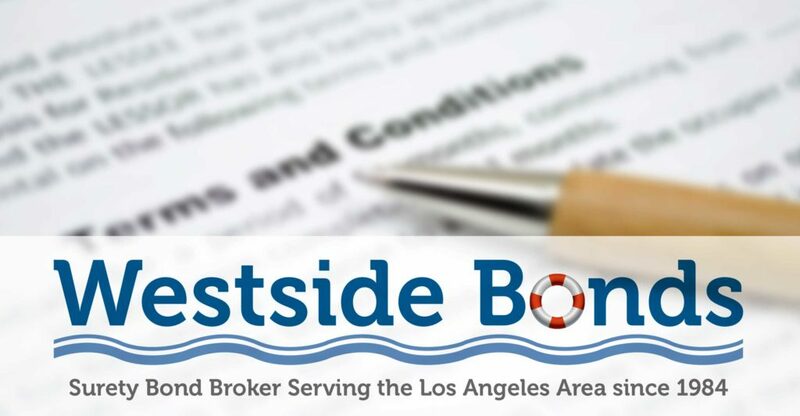 If you decide to purchase a surety bond or services from Westside Bonds, the terms and conditions specified in your policy or indemnity agreement will apply. This website is owned and operated by Westside Bonds. Reproduction of the content, graphics, logo, design or layout is prohibited. Unauthorized use of this website may result in legal action for damages. The content outlined on our website is intended to provide general information pertaining to surety bonds required in the United States. As requirements can change frequently, we make no warranty as to the accuracy or currency of the content. Users of this website must acknowledge that this website may contain errors or inaccuracies. The content is subject to change. On occasion, this website may be hyperlinked to other websites which are not maintained or controlled by Westside Bonds. Such links are provided as informational resources to users, and do not constitute that we endorse the websites. Our agency is not responsible for the content of those websites. If you decide to purchase a surety bond from our agency, please understand that first year premium is fully earned upon issuance of the bond. After the first year, sureties typically allow pro-rated return of premium during subsequent renewal years. Contact our agency if you have any questions.